What is proper skydiving equipment? One might think that it is no big deal jumping of a plane in certain altitude.Well, it is not that simple.If you have not inspected your skydiving equipment something could go seriously wrong and you could end up falling to your death. Who doesn’t enjoy a skydiving exhibition? 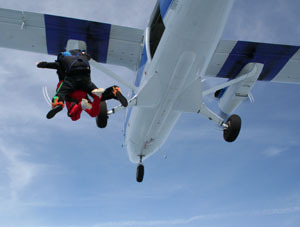 The formation and techniques that experienced skydivers do as they jump, free fall and slowly descend can be breathtaking for the average spectator. If it is exciting for the audience, then it is no doubt twice as exciting for the skydiver himself. But while most skydivers focus on perfecting their skills and using the best and latest equipment, some of them neglect another important aspect of skydiving. This is the parachuting gear. The basic parachuting gear is the jumpsuit. Others use a wing suit. Any skydiver will tell you the importance of a jumpsuit. Imagine if one wears jeans and a tank top during a dive. The clothes would well be torn into pieces because of the pressure from the winds. A jumpsuit protects you from the winds, sun and other elements. It also protects you as you land. Not all landings are perfect. Others land on their back, or your parachute can be caught in a tree, causing you to bruise against the branches. A good jumpsuit must be able to protect you from scratches, cuts and bruises. Aside from the jumpsuit, other pieces which a skydiver must have include protective gear. Helmet, padding and spinal protector are just among the few gadgets that you must wear. Choose the gear that would best suit you. In choosing the right gear, choose one which is made of some durable material, one that does not easily tear or break when exposed to heavy winds. It must also be heat-resistant and waterproof. Also, make sure that the suit fits you well. A suit that is too tight restricts your movement, aside from the fact that it may break or tear upon pressure. One that is too loose may also open easily when subjected to strong winds. There are some sports shops or specialty shops which sell these types of apparel. You may also visit some websites and make an online purchase. Seek advice from your trainer or other professional skydivers as to which apparel or style is better in terms of performance and cost. If you want a perfect-fitting jumpsuit, you can have it tailor-made. There are some tailoring shops which specialize in making skydiving gear. Although this may be a little more costly than the ready-made ones, the comfort that a perfect-fitting jumpsuit brings to the user is priceless. While a new jumpsuit may be ideal, for those who are in a tight budget, there are also used materials that you can find. Ask the sales person from your local sports store or some specialty shop if they have any second-hand apparel for sale. Or your new friends in the skydiving club may have some extra gear that they can sell to you. Because of the forces of nature that a skydiver is exposed to, it is therefore important to invest on some hard-wearing parachuting gear. The gear need not be expensive. The important thing to consider is your comfort and your safety. The gear must be able to protect you as you go through the experience of skydiving. And it must be comfortable so that you will enjoy the experience. Otherwise, all the skydiving lessons and practice that you did will be put to waste if you don’t wear the perfect gear during the dive. 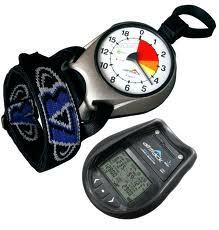 Altimeters are one of the obligatory pieces that you would use for skydiving. You may be surprised with the vast variety of choices. However, it is recommend that you use one that’s easy to read and can give you outstanding after-sales services. In fact there are ones that even give free lifetime warranty for your device. Such kind of service is especially useful if ever you drop your device on the creeper pad. Even though these are not strictly compulsory, you might enjoy the extra security and benefits of wearing one. Although you do not really have to rely on it, getting an extra altitude warning would be very useful. These are very useful if you’re doing various disciplines like: freefly, flat-fly, and breaking off high. This is because your freefall time would vary from one dive to another. If you want to go freeflying, most coaches wouldn’t let you jump if you don’t have an audible, since they’re such a helpful safety precaution, especially if you’re learning how to fly with higher speeds. Choices would vary from the basic models or the top of the line, which would also act like a log book, measuring your freefall time and speed, and could be connected to a computer to get more statistics. Basically, the more the functions, the higher the price would be. This is yet another mandatory piece. If you’ll be buying one, you should consider bother safety and comfort. You should try on as much as you can so you’d find the perfect fit. If you want extra protection, wearing a full-face would be your right pick. It also gives added security if you’re wearing contact lenses. However, open-faced helmets can allow you easier communication, since you’re able to see the whole face of the person. Nevertheless, they don’t protect your mouth and jaw. You would have to get another pair of goggles for this one. There are also leather frappe hats. Although they do meet the mandatory requirements of wearing a helmet, these can provide you little protection only from injuries. If you’re an experienced diver, these can be an acceptable choice. These are exceptionally useful as protection for your hands. Wearing a pair can protect you from scrapes, line burns, mishaps, and the cold weather. To know if a pair is good for skydiving, they must be appropriately thick to protect you from the cold, while thin enough that you can still feel your handles. To ensure that gloves are suitable for skydiving, you should buy from a skydiving store instead of a general sports shop. Hook knives are also important when you’re jumping. This is another safety measure, just in case you’ll be having a line-over malfunction with your reserve chute. There are various types of hook knives and they all do work. In choosing one, you should get a piece that you particularly like yet can still conveniently fit in your rig. Placing a hook knife on your chest strap is not really a good idea, since it can be easy to lose. Your leg strap is the more preferred choice. To keep your knife sharp, try not to use it for other tasks.